Being a chess academy, our primary work is to produce the highest quality chess lessons. Academy Manager coordinates this work. Finding new authors who can create lessons for RCA students. Propose the topics of new lessons. Get money from your favorite game of chess. Work from home in convenient conditions. Get a long-term job with possibilities of promotion based on your performance. Join our Team of smart, enthusiastic and successful people. Join the world leading chess teaching company and bring your valuable contribution into development of chess. Currently, this is a part-time work which will take about 4 hours daily. If you’d like to know more about this job opportunity and/or are interested in the RCA’s Academy Manager position, please submit your application. Your working experience (where do you work now?). Do you have web pages on any social media websites (Facebook, YouTube etc)? If yes, please, provide the links to your pages. 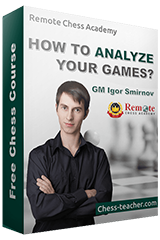 Provide 3-5 examples of good chess video lessons (NOT made by GM Smirnov). Why do you like these lessons? NOTE: in addition to these 4 items, you are welcome to provide any other valuable information about you.